Support your museum and Promote your business at the same time. To be contacted with details and additional information complete this short form. Larry Vering, president of the symphony association board of trustees, and Gail Warmath, president of the museum’s board of trustees, were on hand to look over the new exhibit. Museum Trustee Ed Allen, left, welcome members of the symphony board of trustees during the opening of the new exhibit. From left, Ed Allen, Barbara Lashmet, secretary of the symphony board; Maestro Cal Stewart Kellogg; Larry Vering, president of the symphony board of trustees; Catherine Leas, symphony trustee. 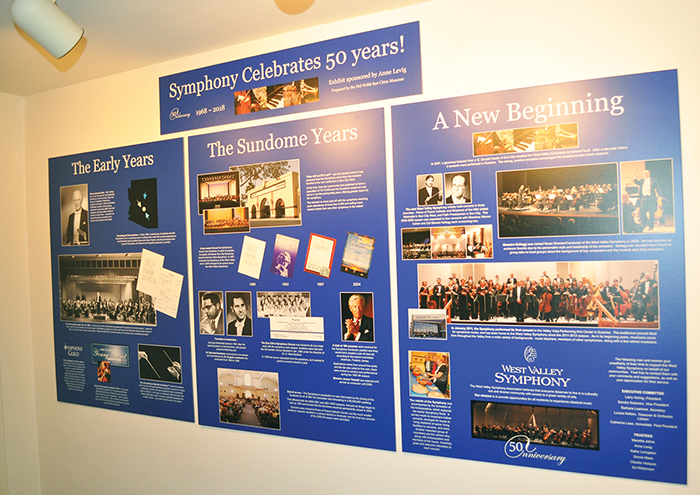 New exhibit celebrates 50 years of the symphony! 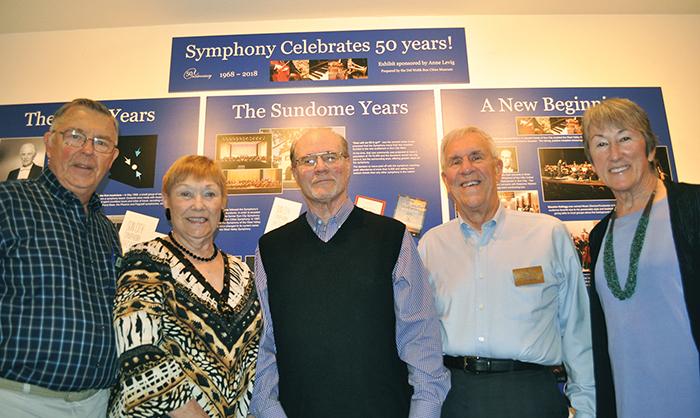 The Del Webb Sun Cities Museum has opened a new exhibit celebrating the 50th anniversary of the West Valley Symphony. Originally known as the Sun City Symphony, the orchestra was founded in 1968 by Lillian and Jennings Butterfield. The orchestra – at the time the only professional symphonic orchestra operating in a retirement community – held its first concert on Nov. 24, 1968 at Mountain View Auditorium. The orchestra would later move to the Sundome Center in Sun City West and become the Sun Cities Symphony Orchestra before changing its name to the West Valley Symphony. The orchestra will kick off its 50th anniversary season 3 p.m. Nov. 18 with a concert at Valley Vista Performing Arts Center in Surprise. The new exhibit features a detailed history of the organization — including a look at conductors over the year, the venues where concerts have been held and the guest artists who have performed with the symphony. 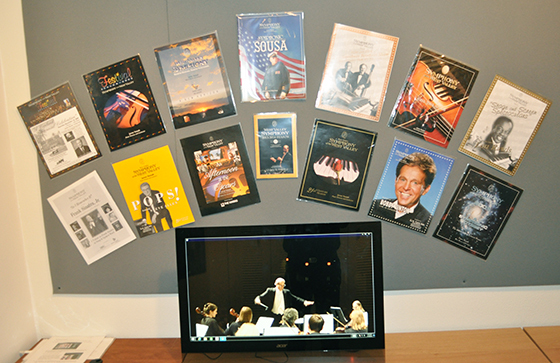 There is also a video of a performance by the current orchestra conducted by Maestro Cal Stewart Kellogg. When his father’s business failed, Webb had to drop out of high school. He helped support his family with his carpentry skills, but his first love was baseball. Ever wonder about this pyramid in Papago Park? It was part of Webb’s growing construction business in the 1930s. Webb loved a challenge and his firm would build the 13-story Madison Square Garden Center atop a busy station serving 650 trains a day. Mr. Gemmill and his family lived on the prosperous Circle One cattle ranch during the 1950s and ‘60s. The ranch was sold to the Del Webb Corporation in the 1970s and eventually torn down to make way for Sun City West. In attendance for the talk were two other original Lizard Acres residents who grew up with Mr. Gemmill and surprised him with their appearance. Jed, left, and Alan Keith, center, renew acquaintances with Judge Gemmill, right. Today is August 5, 2007. I am Beverly Brown, and I am interviewing Jane Freeman in her home for the Sun Cities Area Historical Society. BROWN: Jane, if you would state your name, then tell us a little about yourself and how you came to Sun City. FREEMAN: My name is Jane Freeman. Before we came to Sun City I was born and raised in Erie, Pennsylvania I still have a twin brother living back there Education wise – after high school I went to college. I came through with degrees in bachelors and masters and a doctorate at the University of Virginia From there I went to New York State took a position up there and ended up at a brand new community college. At that time it was called Director of Student Personnel, but it was ultimately changed to Dean of Students. I was there about ten years. My husband and I decided it was time to retire. He got to checking his income and he decided he would get more money retired than he was working. So we started looking around at retirement areas in Florida, Colorado. In the meantime his sister had moved to Sun City so we thought we would come and see what that was all about. We decided we didn’t want to live with all those old people but we came back the next year and it looked pretty good so we did sign up for a house. We moved out here in 1970. The first few years, like everybody else we were involved with a lot of golf and activities at the recreation centers, primarily in silver craft and lapidary. Then my husband died in 1977, not too long after we moved here. That is when I became involved in community volunteer work. BROWN: So what did you start with? What was the first thing you did – first volunteer activity? FREEMAN: I don’t know what the first thing was but I know I became involved with Meals on Wheels, and I am now in my twenty seventh year for that. But in the early ’80’s the Daily News Sun and the Sun City Independent formed what they called a press council. It was composed of about ten or twelve people in Sun City, sort of an ombudsman sounding board. At one of the meetings it came up that we didn’t have a city hall, we didn’t have a chamber of commerce, there was no place of central information where people could go. I said, “We’ve got an anniversary coming up,” that was about in 1982 or ’83. Nobody has got any history, nobody has collected anything. Somebody said why don’t you write one and I said oh sure, like I am an author. But Glenn Sandburg was on the committee and he had done some writing and was doing a newspaper column, so I just facetiously said well, Glenn, how about it, and he said, sure let’s do it. Fools walk in where angels fear to tread. We took on the 25 year history which turned out to be a book called Jubilee. This is Melanie Sturgeon, and on behalf of the Sun Cities Area Historical Society and the Arizona Historical Foundation I am interviewing John Meeker, the former President of the Del Webb Development Company in his home in Phoenix, Arizona. It is March 6, 1996. MEEKER: I was born in Brownwood, Texas in 1926, June 5th. We moved to Arizona and I grew up in the Phoenix area, went to school here, went into the service in 1944, came out in 1946 and went to work for the Webb Corporation. STURGEON: How did you decide to do that? MEEKER: Well, I met Mr. Webb. I used to caddy after school and weekends and I met Mr. Webb on the golf course at Phoenix Country Club in 1941 and started caddying for him and when I finished high school and went into the service he asked me to come back and see him after I got out of the service and I did and decided to give the construction business a whirl rather than go to Arizona State, and I must say that I am very happy that I did because I had a very rewarding working relationship with the Webb Company. STURGEON: And how did you start out when you started there? MEEKER: I started out as the assistant mail clerk. About as low as you can get. From there I worked in various — I worked in the warehouse, then moved into the accounting department, worked for various accounting functions and equipment management. At that time the Webb Company was involved in primarily Type A construction type projects, hospitals, office buildings, high-rise buildings. I worked on the Phoenix Veterans’ Hospital as an assistant job engineer. Then I moved to Kansas City, Missouri on another Veterans’ Hospital which Webb was working on. I was the office manager there. Then I transferred to Travis Air Force Base where Webb was building some barracks buildings for the Air Force. Then went from there to San Manuel, Arizona where I was a job engineer, where they built a thousand homes, a hospital, school, commercial and so forth for the Magma Copper Company. Then I came back to Phoenix and worked on various jobs, hotel jobs and along the way there I worked in Las Vegas on the Sahara Hotel and motel that they built and then came to Phoenix and got involved in the housing in the Phoenix area in 1954-55 and built houses in various locations around the valley for Webb until Sun City was started which was in 1959 and I became involved in the planning and model home design of Sun City. STURGEON: Can I just get you to go back to San Manuel for a minute? Did you, or did the Del Webb Company design the community or how did you do that? MEEKER: No, it was a partnership. I think the Copper Company had a design and Webb just, Webb and a joint venture party from California built it. Webb had built housing in major- had built government housing at times and they built a major project down in Tucson, called Pueblo Gardens back in the early,. ’50’s but the planning on San Manuel I think was done by the Mine. They had it done. MEEKER: No, it was turned over to the mining company and they took it over. STURGEON: So now we are at the planning stages of Sun City. Can you tell me how you decided to build a community that was a retirement community? MEEKER: Tom Breen, the fellow we talked about a while ago, under the direction of Joe Ashton who was a Senior Vice President, or an Executive Vice President at that time. After the land deal was talked about with Boswell let me digress a little bit. Boswell had the acreage at Marinette that his uncle, who headed up the J. G. Boswell Company had purchased from Goodyear Tire and Rubber Company some years back and he sold some land to a developer by the name of Elmer Johns and a Ben Schleifer that did Youngtown. Boswell wasn’t real happy with the way that they were developing, they were going real slowly and when Jacobsen started making the deal the Boswell, which was made in a very short period of time, Breen had kind of a thumbnail sketch research made on Florida on how retirement housing was being offered there. Youngtown was of course retirement at that time but it was very bare bones, low end market. So Breen had a radio station owner that was going on a trip back there as I understand it and he did some research. Out of that evolved that in order to be successful, rather than putting signs up saying “Future shopping center” — “Future Rec Center”; that all those facilities must be built first and there for the people to see or they are not going to come and buy. Sun City, at that time, was pretty remote from Phoenix. The main road was Grand Avenue and Glendale was not very big, Peoria was just a wide spot in the road and had just a very small commercial area. So we were really quite remote. So out of that evolved the decision that they would build a shopping center, a motel, with restaurant, and the shopping center I think in the first phase was 50,000 square feet, and a Rec facility and a golf course, nine holes on the golf course, and five model homes. So the deal was consummated on the land I think in maybe April or May of 1959 and we hired planners to come in and give us their input. We spent about three months with this one fellow from the Coast and he got off on a Venice canal type project because the property was a farm and grew cotton primarily, and had all these wells and he wanted to interconnect them with a series of canals so finally we chucked him and did it ourselves. We were working on it while we were talking to this fellow anyway and we just decided to go ahead with it. So we were, again you got to look at this time frame, this was May of ‘ 59. On January first, or second, I don’t remember the exact date, we opened with the nine holes ready for play, the Rec facility done, the shopping center open, the motel wasn’t quite open but they were getting ready to open with the restaurant, they had twenty rooms and we did all this in six months times. We had to break a few zoning rules and a few rules of the road along the way. A sewer company and a water company had to be put together. The Development Company formed its own Water and Sewer Company. It. was the first private sewer company in the State and met a lot of resistance from the State Health Department because at that time cities and municipalities were the only ones that operated sewer plants and they didn’t like the idea of somebody going private, but anyway we did get it approved and tried to make a deal with the City of Phoenix to take the Sewer and Water Company and they had a blue ribbon committee formed to review it. They reviewed it, and we were going to build it and give it to them and the committee recommended it highly. They had an Assistant City Manager, by the name of Charlie Esser, later I found out he was an attorney, maybe he had an ax to grind with Webb or something, but anyway he nixed the idea and the city did not end up with Sun City which would have been a great tax base for them. Sun City would have been a part of Phoenix, Arizona, but of course today it is still unincorporated. I doubt if it will ever be incorporated. So anyway, we opened, sales started off, we started selling homes from a temporary sales office at Grand and 107th avenue. We had a little sales office that we had used on one of the local housing projects we had build around the valley. We would put a salesman out there by the name of Jack Hayden and he was taking names and when we opened we sold more than 400 houses the first weekend and Jack sold them all because he had all these reservations and there was a lady we had out there by that time — we had an office out there — we were setting up in the shopping center, and we (her name was Ida Sandler) and Ida would go through Jack’s pockets every night because he had checks all over him. Jack was the version of the true salesman Sam. But anyway sales — we sold 1300 houses that first year, which was a great number for that period of time and our management felt that they had discovered a new vehicle to make a lot of money with, so they promptly bought – because the purchase from the Boswell Company originally was for 20,000 acres, which included the land for Sun City West, which was later sold back to Boswell. So the 20,000 figure kind of became a standard figure, so they went over to Sun City California and put together a large acreage. Same thing in Florida. During this time we were also looking on a development out of Houston, Texas, called Clearlake City, which was next door to NASA. It was a joint venture with Exxon, at that time it was Humble Oil Company. We took off and formed a national advertising campaign. So we were busy developing the other projects. The other ones got started in `61 1 believe, Sun City, California, Florida shortly thereafter. Then we even started on in Bakersfield, California, which is not very highly thought of in California. Bakersfield is in the San Joaquin Valley with a lot (–) for and oil refineries and it did not go very well. STURGEON: Let me take you back — why, in the first place did you decide to go to the retirement communities? Why didn’t you just build a suburban development? MEEKER: Well, because it was so far — it was located out of the main stream of development. At that time there was some development on the west side but primarily the most successful development in Phoenix was going north at that time. North, but I mean to say, between Glendale to Scottsdale. But north wasn’t really the primary focus. It was a different, a unique approach. It was a need that was not being met. Youngtown sold a very economical home, but that was it. They had a little shopping center — a little meeting hall, but without direction. From looking at that and then the Florida project they decided that a Rec facility with a golf course — in Florida there had been some — not necessarily sub-division golf courses. We were kind of the pioneer of subdivision golf courses in the country at that time. There were maybe some done but more for Country Clubs, more high dollar, high end type developments. Nothing of the economical homes on the golf course type that we were doing. We had a copy cat in Palm Springs. A guy names Nel Severen build a place called Palm City and copies everything we did and said he was the innovator of it, but he promptly failed, as we almost did too. We strung out our management from California to Florida and Phoenix and our resources. Our sales did not meet expectations in the other cities like Arizona had done. Sales began to fall off in Arizona as well as the others. By 1965 that 1300 had gone down to less than 400. Our advertising people had gotten into — by that time we had a major — we had more than fifty people in an in-house advertising: group. They got into selling vitamins by mail and kind of lost sight of what we were doing. Mr. Webb made a decision one day, he said, run them all off and he ran them all off, including Breen and Ashton_ Jacobson stayed for a while. He was Executive Vice President right under Webb. I got given the responsibility for the Sun Cities. We kind of — that was in 1965 and our winter traffic had all gone — at that time we had the standard philosophy that most developers have that we would build the house and try to stay uninvolved with the residents after they moved in. But that was kind of hard to do when we were doing a — the Marinette Ranch was the first development that had more than 8,000 acres in it and Sun City was going to be there for a long time and that was easier said than done. So when, the first Rec facility was built it served a certain geographical neighborhood. When the second Rec facility was built it served a certain geographical area. Immediately there were conflicts between the two as to cross-use, they wouldn’t permit it. People would want to have people come over to play bridge with their groups and they couldn’t, and they couldn’t go to the other one and it became a very sticky wicket. That contributed to the downturn in sales. And the philosophy was also at that time to advertise nationally and to bring the people there. Not a great effort was put on the residents. Now there were some people — well later on we changed that philosophy. When I took over I came from the building side, I was not in the sales and marketing end. Fact of the matter is I didn’t think too much of sales and marketing. Particularly the ones we had because of course if they didn’t get them sold we didn’t have anything to build. To keep me from getting into a problem with all this big marketing group my boss at that time decided that he knew that I would go right after those marketing people and he said, let me take care of that, and he did. So we replaced more than fifty people with three people — in the marketing people. But we changed the philosophy in Sun City. A simple philosophy. We became involved with the people. We were going to work on those people for referrals that our sales were coming from referrals from people who were happy and were bringing in their friends. So we decided that rather than spend millions of dollars on advertising we would commence spending; it on the residents. We made a change in the project managers. I brought Owen Childress to Sun City in 1966 or ’67 and he was — he had worked with me in housing on the local projects but he was on the finance side and he sales side and he was involved with corporate management. But they agreed to let him come out to be Project Manager at Sun City and his first responsibility was to unite the Rec facilities. He, with the help of Bill Chapman, and a number of other residents brought; that about. At that time we were getting ready to build a third Rec facility. We had turned sales around. We had taken them from 400 to 600 and 800 we were getting ready to build a third Rec facility. It was voted in overwhelmingly by the residents and we got that out of the way. Our next step was to — one of our marketing people — a man by the name of Harvey Sheehan came up with a idea that we could take some of the King’s Inn hotel rooms — at that time I think we had maybe 75 or 80 rooms there. We could take half the rooms and use it on what we called a vacation program. There were some semblance of one before where if they came they would give them credit for their room rate if they bought a home, but we evolved that program — that program evolved into where we took half of the rooms. Well the next year we took all of the rooms from the motel. The motel manager didn’t like that too well but eventually went along with it and really supported the program. It became so successful as a sales tool that we built another 97 apartments that we would later sell, then we built another 100 and we were able to fill them during the winter. And of those people that came more than 15% bought homes which is a pretty high figure according to the experts in the business. And we did not pay for their air fare or their transportation. They brought themselves here. And we gave them a couple of rounds of golf and we gave them a little container of Arizona cactus jellies. I think there were four different kinds — prickly pear, saguaro, I don’t know what all they had, but it went over very well. That was our base for our sales. Then in 1967-68 we came up with the idea for an outdoor amphitheater. It was on a plane — we were doing some other housing projects. We had one in Seattle Washington that we were building and I was involved in at that time. On this plane I saw a Time magazine — it was written for the San’ Francisco area and it was talking about a builder who after the war was building a large project in the South San Francisco area, I don’t Recall exactly where but he had a band shell and an entertainment and he used that to sell homes. He was talking about it was still there and the people were still using it after all of those years. That was maybe fifteen years, maybe twenty. I thought that might be a good idea for us, so anyway we built the Sun Bowl. Again it was an advertising vehicle to interest winter residents to come out and see Sun City and also the residents would get to enjoy the entertainment that we put on there. We built it for something less than $200,000, except the budget was probably only $100,000 and we exceeded that a little bit. But Liberace was our first major entertainer and we thought we could cram 7,000 in there. Well, we sold 7000 tickets and we could have probably sold 14,000 tickets because Liberace in those days, younger people aren’t familiar with him but he was a TV piano player, entertainer and became a headliner in Las Vegas later, but at that time he was on his way up and he had a half hour show and all the older people liked him. Any Liberace filled the house and from then it was onward and upward. We brought in the Lawrence Welk stars and we had entertainment every week in the wintertime. The people brought their own chairs and it was low cost. We were just trying to break even on it, if that. We would put the entertainers up at Mountain Shadows which the Webb Company owned at that time. Out sales reflected this. We went from 1100 to 1800. But all of a sudden we ran into a major problem. There was a cattle feeding operation south of Olive called Spur Feedlots. They were feeding 5 or ten thousand head of cattle and all of a sudden they started feeding 50,000 head of cattle. The prevailing wind was from that direction, so consequently we had a major odor problem. We also had problems with the F 104’s flying over from Luke Field. They were about ten or twelve miles off the end of the runway but they would still line up over Sun City and take off and if they flew low altitude it was very noisy. Through a lot of effort over the years we overcame that problem. We got them to re-route. Every time they changed base commanders every two or three years we would have to go through the same fight. But the cattle feeding situation grew worse. We tried to buy the land and they wouldn’t sell it. We offered to move them and they didn’t want that. They wanted a big premium. We went to court. Went all the way through court and the Judge ruled in our favor. The cattle feeders took, it to the Supreme Court and they took jurisdiction. We found out what cowboy justice was at that time because the Supreme Court said reverse the Judge and said we were liable and not them. Although Youngtown was there ahead of when this cattle feeding operation was built, they just disregarded all that. So we ended up having to pay the damages. We had to pay for the move. Which we did rather than appeal it. As a sidebar I am — every once in a while I will meet some attorney and they will ask what my name is and I was with Webb and they will say, Oh yeah, you were involved in that Spur Feedlot situation. I say yes, and apparently that was a landmark case that they used in law school on nuisance cases and every one of them asked me, why didn’t you appeal that to the Supreme Court. You could have won that. But we didn’t because it would have ended up costing a lot of money, more money to appeal it than it would to settle it, so we settled it and got it out of the way. By that time we were building toward Olive and we were going to have to cross Grand Avenue and we were working on a hospital out there. I think I moved my offices out there in 1970 and so we were selling, I think, 1700-1800 houses a year by that time. We were trying to build a little — we had been working on it for three or four years — to put a hospital together. Management agreed to let us help a group of local residents built a modest 100 bed hospital. We would give them the ground and would help them build it. Jim Boswell mentioned one day that he might have an idea or two on the hospital. He said you are not looking far enough ahead. So we were in the process of putting on a fund raising drive and he said If you will make these conditions I think that what you really ought to do is to look at the hospital history — I may not have this exactly correct, but anyway he said he would give us a matching grant of a million hundred or two hundred thousand dollars and if we would build a facility that would serve all of the northwest area. Then it would be named William 0. Boswell Hospital. The residents would match his grant. We said, well those first two are easy now we got to get the people to come up with the money. Well, we hired a fund raiser and that was in 1967 or 8 and anyway, the residents pledged more than a million dollars as I Recall. Boswell came with the money and then Mr. Webb, through his ownership of the Yankees had become acquainted with the Mayo Clinic and used the Mayo Clinic himself for his physical checkups, so he had friends there and we went back and we ended up using Mayo’s architect and built a facility that would serve older people in the radial nursing units where there were nurses stations in the center and the patients could literally see the nurses’ station so they would feel more secure, because the older people would like that, so we did that and the hospital grew. It started out with a modest hundred — I think we got approval for a hundred beds – put fifty in operation, had a lot of resistance from the local hospitals because they had a local comprehensive health program and they didn’t want anybody taking their business, even though people would die if they had a heart problem before they got there because they didn’t have fireman with the emergency treatments like they have today where the hospital really doesn’t have to be next door – they can stabilize you and transport you. But at that time you had to bring the hospital to the people, so in spite of all the naysayer’s — they said we would never get doctors and we would never get nurses. Finally we were having one of these little meetings and I got a little perturbed and I said, tell you what we are going to do, we are going to build it with or without your support. This health planning council did not have any legal standing. And I said the second thing we are going to do we are going to steal every one of your good nurses. And we are going to come after your doctors and if you really get testy we are going to come after some of your patients too. Well, they didn’t like to hear that and they said, oh you will never get an administrator to come out there to that Podunk place. We had 197 applications for the director of the hospital and we got a good one and he stayed there for a long time, fact he retired from there. So we overcame that, but it seemed like there were a lot of obstacles to overcome because people — even the local newspapers, they did not like what Sun City stood for because they did vote against school bond issues and the schools in the areas were growing but the problem was really not on the residents, they had a school superintendent. He saw Sun City as a vehicle to take up all these —feed, clothe and take care of all the migrant farm workers that lived in the Peoria school district. Well, that didn’t go over too well. He tried it. Matter of fact he was ahead of some of the Federal programs that they have today because they would give them breakfast — but he wanted the Sun City people to pay for that. That was a thorny issue all the way through. Finally after some effort they got mad enough at Sun City and at us that they decided that Peoria School District would go its way and Sun City would go its way and so they did. But Sun City did have some children but they had enough taxes to send them to other schools so it became a non-district. But Sun City really — we had bigger and better Rec facilities, we were always looking — the Sun Bowl was successful; the vacation program was working, we were running more than 200,000 people a year through our sales offices at that time. Fact is it got up to 250,000 people going through the sales office each year, which is an astronomical number. So we were looking for bigger and better things. There was a group that was into bowling out there and they didn’t have a facility, they had to drive a long ways and they asked if we couldn’t get an operator to come to Sun City and so we got our commercial people — we built and operated the shopping centers and we went after all the major operators and the only way we could get one to come out there was if we built the facility and gave it to him rent free then he would come and his rates Would still be the same as Phoenix rates. And I said the heck with that, we will built it as part of our Rec facilities and so we went to the Rec board and we had some people there who didn’t think too much of the idea and I said well we are going to do it, it doesn’t come out of your fee, we are going to do it above that. When we added the Rec facilities we agreed to spend so much a household on Rec facilities and we always exceeded that considerably as we went along and we felt we were in a position to say that we are putting that in at our expense and it pays for itself. And we put a caveat in there that said that they couldn’t use it to make money to offset other expenses. Which I understand later that they came back later and tried to do, but that wasn’t a part of our deal with them. I think we built sixteen lanes and with room to go to twenty four. It got expanded and that became very popular. We had a fellow come to us who wanted to put in a mini-golf course — miniature golf. That lit a light. I said, well that would be a nice idea for us to put in our Rec facilities, so we did, and it became heavily used. When we combined the Rec facilities, the people in Oakmont, which was the first Rec center wanted some renovation work done which we agreed to do and did do as a part to overcome the problems. But it really – the Rec facilities then were available to all the residents, so when we built the Bowling facility at Lakeview, everybody can use it. That was the first mini-golf overlooking the lake. We brought the lake idea back with us from Florida_ We were really the first lake — we didn’t like to say that too much because the water conservation people didn’t like the idea of a man-made lake out there. They thought we were wasting water so we didn’t advertise that too much. We ran the golf course water through the lake so it would circulate the lake water and so technically we weren’t just building a lake for residents it was a part of the golf course. So we were always looking for better and new equipment in the Rec facilities. We had a great relationship with the residents on that. We had a gentleman come to us who was into weight lifting and wanted to donate some money for it and we said to heck with it we will put one in and so we put in a Universal gym and out of the universal gym today fitness is a major, major item in Sun City. And it was the same with hobbies that would come and go that people would like. But I think that really the success was listening to the people and staying involved with them. And Jerry Svendson and Tom Austin prior to him, but Austin was really in the early years he did a heck of a job out there with what he had to work with. He tried to get everybody involved but Tom later went into the commercial leasing and I don’t think he liked that too well. He eventually left but Jerry Svendson came on and then we hired Don Tuffs to help him on the Sun Bowl because it was a major effort and both Jerry and Don went over real well with the residents. They were young men and people kind of looked upon them like their sons, like they would their sons. They told corny jokes and they would warm up the audience at the head of the acts that we put on and I must say that they did a heck of a job. But we went on to sell in the range of 2200 to 2500 units a year during the seventies, with a down turn coming in ’76 when the energy crunch hit, but then it picked right on back up, and in 1978 we sold out. We sold thirty-four hundred fifty houses in 1978 and sold out Sun City and were taking reservations for Sun City West. Which was really a couple of years ahead of our schedule. We had planned to go with Sun City West — we had purchased the land in the early 70’s for Sun City West. The Sun Bowl really spawned the Sun Dome. The reason that name came about – Somebody sicced us on to an architect out of New York that had an inflated dome that would — they had built them in Iowa and Florida, and you could use and it was more economical to build, but when we got into it, the noise was a tremendous problem and we sent out people back to see the ones that were standard structure. That is how the Sundome was built. But then we were working on the planning in the late `70’s for Sun City West. Did all the planning with the hubs, the major core, were going to have satellite Rec facilities, which Webb has pretty well followed. However, they never did put in the neighborhood shopping center like we did in Sun City, which I felt was a mistake and still do because they only had the one grocery store in Sun City and the one on the periphery now, which makes it a little inconvenient for the residents. Yeah, but the churches sell houses and we used it as a sales tool, same with the golf courses. We ended up giving the golf courses to the residents because we operated them on a break even basis. Course that is where the big bad company, they always wanted to argue with us, they thought we had a lot of overhead in there and we didn’t. Now they operate them and they are doing a good job. They really are. They have done very well. But we did the planning on Sun City West on the golf courses. We had 11,000 reservations when we went over there which was almost the first phase — under normal circumstances we would close perhaps 60 to 70 percent of those reservations. It ended up less, we ended up closing about 50 percent of them — 40 percent of them, which is good, even though interest rates went to 21%, in the early `80’s which was a bad time. But Sun City evolved because there were people — residents that cared and there were people within the Webb organization that cared and that is why it succeeded, pure and simple. When there was a problem we got together and we solved it, i.e. the hospital. That is a major facility now. We had to get a few tax laws changed, we had to get legislation so they could sell tax free bonds. We found a way and we got that done, through the county, so they could sell their bonds for financing. We financed the hospital. They didn’t have enough money to build the second wing. We stepped up, co-signed with the bank so they could. And we got that five million dollars. We were there. We were just there pushing them along a little bit. But there were people like Bill Chapman, and John Meade who were the head of the hospital board (he died) and many, many others who became involved. There were people on the Rec board. A guy named Myron Wagoner who was head of the Rec center when we started building better Rec facilities and when we went with the indoor facility at Sun Dial — an indoor pool — a lot of naysayer’s — they didn’t like that idea. I said, well that is what we are going to have, you better get used to it. But they stood in there because we were trying to give them something so they had the broad spectrum of facilities. Then when we built Bell Rec center, it was really a nice facility. We blew all of our budget, all of our budget that we were supposed to build for them and all of our budget that we had in reserve. We didn’t have any money left and they made that decision. They wanted to go with one more and not build one north of Bell Road and they called that facility Meeker’s revenge up there, because they said, we didn’t want to build it, it was on a map, future. Well you get into trouble when you put future down there. Somebody assumes it is going to be there so we had to end up going out of our own pocket to go up there and put a small facility in. But it is being used so I guess it really was needed — they needed another pool. And then we introduced tennis, and met resistance there. They didn’t want the maintenance on it. Anytime you mention maintenance to the Rec facilities people they want to go the other way because it costs money. That is understandable but built two courts and then we built more at Lakeview Center and then we built 7 or 9 at Bell Rec facility. Nice facility. Then we built a park at Lakeview with the excavation from the lake. You ought to go take the tour and see how it evolved then go back across Grand Avenue then go to Lakeview and just see how it changed. STURGEON: I’ve done that with the architecture — with the houses. MEEKER: But go to the Rec facilities and see how those happy those people are. Yeah, there are some of them old but — you know, the average life of a home in the conventional communities — the average stay of the family is less than seven years. Out there it is longer. But as the people pass on, or get to old to live there, another family comes in and takes their spot. It has worked out quite well. STURGEON: Now, did you decide to put in any facilities for long term care, for people who don’t want to go to the hospital, don’t want to move out, or was that private? MEEKER: Well, management made a decision and that was one area of retirement that we would stay out of. At that time there weren’t really any major operators in it. We put a lot of effort into getting a nursing home operator to come to Sun City. We helped them in fact, gave them a very attractive land deal so that they would come and we would have it next to the hospital. But that has evolved until now there is competition in it and there are people — church people would come in and charge people big fees and then they would go broke, couldn’t take care of it. We knew if we got into it we would be just have to take care of them, so we opted to stay out of it. That was a wise decision. It is better – then the people – what is that called, Royal Oaks? Again, Earl Walker, the same guy that came to me on the universal gym, he and a minister said, we’ve got an idea. I said that sounds like a winner to me. We helped them; I helped them and got it done. The people got it done, they raised their own money. That is the way it should be. You can’t – you have profit operators in there and they aren’t going to get the right care and prices are going to go up. There were some snipers, people around the periphery — a guy came in there with an operation on 99th Avenue across from Sun City and Peoria, I forget the name of it. Sunshine Services was a church oriented operation. They did a good job. They focused on the need. They had some intermediate care, some long term care. There again, they ran out of money and they said, we don’t know what we are going to do. I said, how much do you need, I think they said $25,000 and I gave them $50,000. You can pay us back when you get the money. They got through the thing and they paid it back, every penny. It was really kind of like a family operation, and again the people were not, did not ask for a lot of stuff that was not needed. Sunshine Services, you are familiar with that, started in that minister’s car port and we helped him all the way. We built a little facility for him on a piece of commercial ground and they outgrew that promptly. We built another facility over across Grand Avenue and we thought, man, they will never fill that up, and they did and doubled it since. Biggest Abby Rents in the country. But is all for free, with volunteers. Reverend Thistlewaite was the guy that ran that operation. They gave of themselves. Have you ever gotten involved in the hospital? Look at that and see how people will help one another. Look at the volunteers. One of the largest volunteer organizations in the country. I know it is the largest in the state. STURGEON: I think that is true of almost everything in Sun City. MEEKER: They become involved. It is great to see as the hospital rose up it became involved in the overall medical picture, to make sure that they had care. They stepped into the breach there and when I say they, the board is Sun City residents. Not the Administrator, that administrator runs it but that board is involved. They have been very fortunate, they had Austin Turner, then Lee Peterson is the administrator now, and they have done a heck of a job. First class facilities, first radial nursing units in the state. But the thing looking back that surprised me as I mentioned a while ago, was the opposition that we had from local and it is still there. They look on Sun City as a bunch of greedy old people, but I got to tell you something, those people create jobs. They are like a clean industry. They do nothing but spend money. And when they spend money that goes through the businesses here in this valley. The deposits that they had at the banks — they were well over a billion dollars back in the 80’s, I don’t know what it is now. It was an astronomical fee. We had 29 Savings and Loans and bank branches out there in Sun City alone. Of course the fallout reduced that down. The reason they were there was because there were depositors. They weren’t there just for looks. Sun City has been good for the valley. The school situation, there were some outspoken residents on that. They get a little wild eyed when you mention that one. When we came to the unorganized school district that took them out of the way and got them out of the – The only thing they are still wild-eyed out there about is incorporation. I think they are wrong in not incorporating. They should because they could help themselves a lot better than they do now. They would get tax funds to do it. But they have a terrible time with a city and they see more taxes. It really wouldn’t be that way. They could operate their Rec facilities at a lower cost and so forth. STURGEON: You see the study, did you not? MEEKER: Yeah, we did a study. We had a study made. We worked on it but it was just a losing battle. They never let it come to vote — they did not want that to come to vote. That is unfortunate. Because they do not get the representation. They have it politically because of the supervisors and representatives, but they do not have it as a Mayor and the standing that they should have. They are a major force. There are 70,000 people really that are not represented at the level they should be, i.e. they don’t have a Major, or an official spokesman. They have a lot of self appointed ones but they sometimes aren’t quite right. Fortunately they have had some good ones, but it doesn’t really give a good image of Sun City. It has been a very positive thing. It has been a very rewarding thing for me to have been involved in it. I would like to feel that we extended those peoples lives some. How much would be a hard thing to determine, but we did make their lives happier and by their staying active I have got to assume that it makes them live longer. STURGEON: Where did you come up with the phrase, active retirement? MEEKER: Well, that was Bob Garland. He came with that and “an active new way of life”. You see at the time they called retirement and they still do, they will call it a retirement village when it is a building for long term care. An intermediate care type facility where people that are elderly, that can’t drive anymore and they want to have their meals there. But Bob Garland was the one who came up with that. I’ll see if I can track him down. He would be worthwhile talking to. He worked closely with Crane on the advertising and as I say wrote the song. He was an energetic guy, still is, nice looking man and did a hell of a job. Our problem was we went too far flung too fast and really stretched our management, spread it around and didn’t pay attention to what was at hand. Although maybe we were lucky. I came from the construction side and when we made the decision, a simple one, to become involved with the people and spend the money on them it turned out to be a wise one. The residents did in fact entice their friends to come and buy in Sun City and they in turn had friends and it just snowballed. STURGEON: Did you do the same thing in the other Sun Cities? MEEKER: We did on a more — in California it was not an immigration state at that time, so we were really dealing with a different market. We were really dealing with just a strictly California market. It was very difficult to reach them – to get to the California market. We were remote. We were out of Riverside, out of Escondido and it is all built up around there now, but at that time it was really remote. Didn’t even have a major freeway. The freeway is at the front door now, but it wasn’t then. The same in Florida. Unfortunately in Florida the decision was made to buy where they did because they passed a piece of ground in Sarasota, Florida to somebody. They had tried to develop and had waterways, right on the gulf of Mexico, I don’t know whether they had a golf course or not, but the shopping center was there. They failed and it was only 5,000 acres. But our management said, we need 20,000 acres. Well, that wasn’t really quite right. It took Sun City, Arizona which was very successful. When you sell 2,000 houses a year you are really in the super league, you are beyond the major leagues. Not many developments do that. In fact Sun City, Arizona was the largest development of its kind by a single builder in the history of this country. Leavitt Town built 14,000 units. Sun City built 25,000 units. It was a great experience and it is kind of nice seeing them carrying it on. Webb Company got out of the gambling business, that was our Achilles heel and are now concentrating on retirement all over the country. I hope they don’t have the same problems we did building here there and everywhere. California would have been a very successful project but at the time it got started we had a lot of sales, several hundred sales and we were union at the time because we did commercial building. The carpenters went out on strike and consequently no work was done for several months and we lost a lot of sales, and we never did recoup from that. It was 200-250 houses a year operation and you can’t make a Iot of money building 250 houses. Not with the kind of overhead that you have, carrying costs on the land. And that was a bad deal in both Florida and California. Boswell was half owner, the land was purchased without any carrying costs on it. He had a fixed price on the land, so much an acre and we took it down as we needed it. But he got his money back. He got half of the profit on it. That is one of the major reasons it was successful and the others weren’t. Location had a great deal to do with it. Phoenix was a dynamic growing community, and Tampa, at that time was a dirty port city. Riverside California was not very big, not very much there. STURGEON: One of the things that you notice when you go from Sun City and you drive across Grand Avenue, there is a difference in the way the houses look, they are much more elaborate. Why did you decide to change things? MEEKER: Well, if you go down into the southern part of Sun City, south of Grand Avenue toward Olive, you will see that transition taking place. Again the previous management, previous to my taking over felt we should build a very Spartan home. They were dead wrong. The people wanted a nicer looking home and they wanted bigger homes. They did not all want a little thousand square foot cracker box. They wanted nicer amenities in their homes. So we built some experimental homes, we called them_ We went out and built them. We put three or four items in there to see what they were, and they were kind of far out in some regards, like a Jacuzzi inside and this was back in the `60’s and that was kind of ahead of its time. They didn’t like this and they didn’t like that and we gave away a bicycle, a three wheel bicycle if they would fill out the form. Well, we got thousands of elaborately filled out questionnaires, all to win that lousy bicycle. But we thought that’s a good deal. There is one other thing that I didn’t mention here that was a factor in getting the people involved with themselves. Jerry Svendsen came in and said, I can’t get these people to come to their clubs. He was getting ten, twelve, fifteen people. After that experimental home with the bicycle I said Jerry, tell you what you do. At that time a 25 inch TV was the biggest they made. I said go buy the biggest twenty five inch console and give it — I don’t care if five people show up, give it away as a door prize. He was giving dinners for two at the King Inn’s as door prizes. I said I will guarantee they will be there next time. He gave away that TV and the next time — I think twelve people showed up or maybe fifteen, and the next time there were 150 people and we had of course to do that a few times. But when they all got together they became involved with one another it took off. The clubs really got going, but it took a boost from us to get it done. Just that simple, stupid but simple. There were a lot of players. Jerry and Don Tusk were two key players. Owen Childress was while he was there. Our corporate treasurer died and he went down and took that position in the early 70’s, but he certainly helped get the thing headed in the right way. It took a team of our people but again our people cared and we cared about the quality of house we gave, even though they were small little homes, they were nice homes. We introduced the brick veneer as we upgraded. But that veneer was on south down to Olive and we just took it on across the road. When we built the model homes on the lake we built a couple of showpieces in there that were rather elaborate, but that was all for merchandising. We did not expect to sell a lot of the large homes, two thousand twenty five square feet. If we sold twenty a year that was OK with us. We were after those fifteen — seventeen hundred square footers, and that is where the sales were. Ten to fifteen percent would buy on the low end always, and that was always there. We kept the same little thousand square foot model always. We always had that house there. Different versions. But there were certain people that would buy them. They thought they would come and live here six months and live someplace else six months, so they didn’t want a great big home. Those people had money and they were coming down from bigger homes, and they wanted a little better home than we were offering originally. So through those experimental homes we stepped it up a little. We were having a union problem here in ’75-’76. Plumbers were making $22 to $25 an hour —electricians the same. Carpenters were grossing $20 an hour. That meant building costs went up. So we came up with an idea of building manufactured homes so we started a component plant over in Sun City West. We did that as an answer to hold the prices down. It meant that we would have to go to a more contemporary home to do that. But it was not well received by the residents and that was stopped. They wanted a four-twelve pitch roof with an entry way and a kitchen with a window over the sink. They did not like inside baths, they wanted a window in the bath. That came out loud and clear, particularly a kitchen — they wanted a window over that sink and they wanted it out to the back yard, not into the side. STURGEON: Did you find that out through trial and error? MEEKER: No, those experimental homes, the questionnaires — they told you. We could tell — some of them were signing them and we could look them up and see what kind of homes they owned. You could really tell because they would tell you what they didn’t like about their house. But we tried to really give them — we gave them the best bathroom fixtures that we could buy — American Standard — we gave them quality. We gave them single lever bathroom faucets and kitchen faucets — way ahead — it was not the standard then. You had to pay extra for them. The elongated toilets. In those days it was a little cheap toilet and a big person couldn’t hardly sit on them. That was after the war and that was what they sold a lot of Builders would buy the cheapest ones. And we leaned on American Standard and I said, why is that more money — why is that twenty dollars more than the other one. The guy couldn’t answer me. So finally it got down — it was a union problem — they gave them as a concession — they gave them extra money to make elongated water closets and I said, well you got to do better than that. Finally for a dollar more we got the elongated water closets. We made American Standard come up with a – and it is still their biggest seller today. Everything was a fight to do because people had been doing it a certain way. But we did give them quality. We were at the forefront on insulation, even when we built the little block houses to start with we built them with zonolite, which is insulating material, to cut down on their heating and cooling costs. I think in the long term it really paid off for the people. They have really kept that community pretty well up. Those houses are approaching thirty five years old and some of them look pretty good. There are a few bad ones here and there where they haven’t spent the money. But when you go above Grand Avenue you see the difference and the reason you see that is we built south and then turned around and went north and you just see them evolve into better homes. STURGEON: What about Sun City West? Those homes seem even bigger than the others. MEEKER: Well, they really aren’t. In fact the first 5,000 sales we sold off the models in Sun City. But they look bigger because they got higher ceilings. When you build a house in the new styles today — ten foot ceilings, not eight foot ceilings and twelve foot ceilings. We did that back in the 70’s and we got shot down in flames. We built some high ceilings and they said this is going to cost money to maintain. They didn’t sell well so we stopped doing it. That was when we came with some angled walls and did some different things — some real nice patio home designs — excellent patio designs. Today they are great designs but we were just a shade ahead of our times — they weren’t ready to accept them. Another thing they liked — they liked the eating space in the kitchen — a breakfast space. Most plans back then in the 60’s did not have that on the lower end. You got a little up in the middle price homes they had it. STURGEON: When people were buying their homes how were they financing them? MEEKER: Cash. Seventy percent paid cash and that figure is probably still good today. We had financing for them. We had FHA financing and we finally had to quit that because they wouldn’t take it. The people that financed their homes we just lined it up and they would go make their own arrangements. Eventually they would pay those off. The bankers would tell us they would pay them off in three to five years. They all kept twenty five thousand dollars ready available ready cash. Don’t ask me why it was twenty five because I couldn’t tell you. That may have changed today but they always had that twenty five thousand dollars. They would lie on their financial statements, they would always understate it, probably 50, maybe 100 percent. They still do that too. They don’t want to tell people the kind of money they have. But you talk to some people out there and they will tell you — it changed. There was a change took place. In the 60’s the people that would relocate did not have a great deal of money. Now you have got to understand they didn’t have pension plans like are out there today. They had to save their own money. Social Security wasn’t around at the amount that it is today. The change started taking place in the late 70’s. The cross section of the buyers had stepped up. You got a more affluent buyer than we originally got. I think that came about because we had a better product. Originally all the gerontologists said that it was a mistake to move into a community like Sun City. They really knocked us. I mean, nationally. They really came up with all kinds of excuses and they really worked us over. They said, oh they are all going to die. People just sitting around waiting to die. Esquire came out with a big article. They had people sitting on the park benches like they were ghosts waiting to die. Terrible, negative piece. But they overlooked one thing. That when the people do pass on, another couple buys that home and the process starts over again. The average age hasn’t gone to 80. In Sun City I would imagine it — it was below 65 for a long time — then in the late 80’s in Sun City it was maybe 67. I don’t know what it would be now. It might be around 70. But it had not gone way up. So people are living longer. They are more active. Because they are 65 their brains don’t go away. I can speak with authority on that one. You don’t really think any different than you did when you were 30. STURGEON: Did you learn anything, besides the homes, that you took with you to Sun City West when you were designing it? MEEKER: Sure. Look, the Rec facilities and the concept. They really like a neighborhood concept. In Sun City West, the design there was to have a major core in the center. At the time that we did Sun City West we owned 13,000 acres. We owned the grounds South. So the idea was we were going to put a regional shopping center in the core across from the Sundome. That would be a major — we tried awfully hard to get a Penny’s or major store to come to Sun City and never were successful. That would all back up in there and we would have satellite Rec facilities all around. We built the bowling alley there. We thought maybe we might have to build another one in Phase 2 which was south of Grand and then a neighborhood shopping center. That is a service station, a grocery store, a drug store and normal neighborhood grocery store type deal. But that kind of got changed a little because the grocery stores started building super stores. A big store used to be 25,000 feet, that was a big grocery store. But I guess now they are 100,000 feet. That changed it a little bit. But the neighborhood concept was a strong one and that is the way we planned it. Webb didn’t call it that. Then Swanson sold all the ground out and made a quick buck on it. STURGEON: When you look back on your involvement in Sun City do you feel that perhaps you got too involved in the community? I know there was a sense of betrayal when you moved over so Sun City West. MEEKER: Well, no, we did not get too involved. We were on the flank always. We were behind the scenes pusher to make things happen. If a church needed help we were there. We didn’t advertise, but we helped things. Webb died in 1974, but in their minds Del Webb personally built their homes. They will tell you that today. That never did happen of course. But it was a respect that they had for him because it was Del Webb. Del Webb did this. And Del Webb was a company that was doing it but in his name. He got a little squeamish about that himself. He said, what you are doing to me out here. They just really looked up to him because we were taking care of their needs and they felt a little betrayed. When we moved over there, and again had I stayed over there I would have fostered that relationship and I would have weaned off easy, but this guy Swanson just went BAM, saving money and really hurt the Webb Company because that was a source of referrals again, even though they were Sun City. And some of it they brought on themselves. We tried to meld the two communities together; that was our plan. There was a faction in Sun City that fought us tooth and toenail. We don’t want any part of that, we have Sun City and they really were short sighted because they couldn’t see what we were coming with over there and it was going to be bigger and better. They made us separate the water company. We had a private water and serer company. Citizens served Sun City and they didn’t want them to be served off the same contract, although we had it. The way it was written we could have done it but we chose not to. So they felt their rates might go up. Their rates might have gone up a few pennies, but in the long pull it would have held their rates down. It was a fight we couldn’t win so we said, fine, if that is the way you want it that is the way it will be and that is the way we did it. So some of that was brought on by some naysayers. There was a group that wanted to take over and run Sun City. Some big town Philadelphia police chief, he passed away but he was an argumentative type guy and he wanted power. But I think the Webb people should have stayed a little closer, but they have jumped back in there a little bit. STURGEON: First, setting up Sun City, had you articulated a plan for what you were going to do with the Rec centers once the area had filled up and you were going to build another one or did this just sort of evolve over time. MEEKER: Well, originally each Rec center would serve a geographical area and it would be deed over to the residents of that geographical area. And that was done. But out of that evolved the cross use problem that I spoke about earlier. When we got ready to do the third one we got sales turn around and we were going upward, we got them to form one Rec facility that would own all the facilities in Sun City. The golf courses were not a part of that deal originally. We ended up giving the golf courses to the Rec facilities for the residents because they were the only entity out there that was for all of the residents. But now that is a standard part of the deal, the golf courses go with the Rec facilities. In Sun City West we overcame that problem. When we went to Sun City West we formed an unorganized school district right out of the shoot so that we wouldn’t have that problem. The school district went along with it. But the people — what is really overlooked a lot is the volunteers that spend hours tutoring children that can’t speak English, tutoring adults that can’t speak English. Sun City people do it today. Sun City West people do it. But it is never heard of. They go out there and take care of those people. They try to help them. They can’t speak English and help them wherever they can. But the other side of that there are a lot of takers that are just takers and really don’t help themselves. The same ones that were moochers way back when are still moochers. But they have fun. Really helped a great deal in the community in that regard. STURGEON: What about the water and the sewer plants. Do you still own those? MEEKER: No, no. We started out owning them but later in the early 60’s we decided we needed a fifty cent raise on water, maybe twenty five cent on sewer monthly. You would have thought we had started a civil war. Because we were Webb they said you are taking our money. Those are ours, we paid for them already and that argument started, because on some brochure it says, sewer and water in and paid for. Well, it was in and paid for, but the operating costs weren’t. So we sold it to Citizens Utilities and they came in and operated it. They promptly went for a rate increase and got it but they didn’t get the heat that we did. But as I said earlier we tried to give it to the city of Phoenix and they missed the boat there. They could have had all of that — they could have had Sun City for a tax base. That would have been good for Sun City too because they would have got all the garbage collection and police protection. But they didn’t happen and the people organized the Sherrill s Posse and took care of themselves. And of course we helped them there. We were there. They needed a spot and we gave them a spot. We gave them a piece of land for a token and they built their headquarters, but they raised the money themselves. STURGEON: As you look back on all your years of dealing with Sun City what do you think was the biggest challenge you faced? MEEKER: Really there wasn’t any. The biggest headache we faced was the cattle feeding situation, because it was a problem for the residents and we felt their pain and not being able to do something about it quicker than we did. When we won the law suit the cattle feeder went out there and piled manure fifty feet high and a half a mile long Olive just to make it worse. When we reported that to the Judge they removed that the next day. The Judge said you will either remove that or you will go to jail. That wasn’t too smart on their part. But that was the biggest headache that we had. And incorporation, being frustrated and not being able to articulate the message that it was for their good, not Webb’s good. They thought we were trying to abandon them when we were trying to get them incorporated, the way they looked at it. But it wasn’t true. But no matter what you said they had their opinion and we weren’t not going to change it so we accepted that. STURGEON: Now when I was talking to Tom Austin he remembered that the company had not planned on any mortuary and no cemeteries and that sort of thing. What changed that? MEEKER: That is correct. A salesman walked in talked to some of our management and said here is the kind of money you can make if you build one and at that time sales had slowed way down — that was in the early 60’s, so they decided to put one up on Del Webb Boulevard, which was a dirt road, north of Grand Avenue. So they were going to take care of the need, and there was a need out there and pre-sale burials, so they embarked on that. It was a money making venture yet it provided a good service when Webb had it. Webb later sold it. I was in my 30’s and I thought that was terrible, because younger people didn’t understand death as older people did. We thought it would be a terrible problem to overcome sales lines to build homes next to it. Not one problem at all.. We put a fence around it and sold those houses. In fact they wanted to live next to the fence. Not a problem. But that is how that evolved. It was put in as a money making venture. There was a need there. There were some other operators came in later but it is still operating. In fact we plan one for Sun City West. Webb took it out. STURGEON: Was the hesitancy to put it in partly because you were selling it as an active retirement community? MEEKER: Again, cemeteries have a bad connotation. But when you get older that is not a bad connotation. We were too young — I was too young to understand that but as you get older and you have been to a lot of funerals of your friends you accept death as a part of life and those people had already accepted that but we didn’t. We didn’t understand that quite so well. But today it wouldn’t bother me at all. Matter of fact I would put one out there and make it a focal point. If one of the mate passes the other one is still there and they are there so they can go see them. We had a lot of crypts. It was very big out there and nice too — first class. But they were nearby. To me, I would put one in without any hesitation today. Again because it is part of the cycle. It is needed as much as a shopping center us needed — as much as a church is needed. STURGEON: The last thing I wanted to ask you is I find it real interesting when I talk to people in Sun City how many of them remember meeting Del Webb, yet when I talk to Tom Austin and some other people who worked with the Del Webb Company, he didn’t actually go out there all that often. MEEKER: He was an icon. Because it was Del Webb Sun City, Del Webb built their home. He didn’t go out there very often. STURGEON: Do you think it was the advertising partly? MEEKER: Yes, and when he did go out there, they really — they idolized him. They thought he was the second coming of Jesus Christ. Really, I bothered him that those people would come up and go gaga over him. It was hard for him to accept that. In fact he told me on several occasions, what in the world have you gotten me in to here. But then he finally accepted that he had a responsibility and we didn’t bring him out there too often, but when we did, it was for a purpose. He was involved in the hospital behind the scenes. He steered us on to the Mayo Clinic and the design that we ended up with. We had a two man design team. Myself and the head guy from (—) Architects. We didn’t have a committee because committees never get anything done. We sat up a lot of nights and we said here is what we are going to do and it was done. We made the decision and we designed it and it got built. STURGEON: Did you do the same things on the homes too? MEEKER: I kept my finger on the homes and all the design I stayed close to. Planning and design, because that was my bag. But, architects, you cannot turn them loose or they will build a monument to themselves. We can’t afford that. We had to build the best looking building that you can build for the least amount of money. You kind of stretched those dollars as much as you can. That was always the battle. The Bell Rec Facility was laid out in a circular fashion so it had access all the way around. By that time we had built the pool and physical therapy facilities were a part of the pool area where people could — Jacuzzi’s came in big. A person would have a stroke and you had to have that at a level where the woman or the man could wheel them in right easy. We recognized that so we just made that. But still there were no steps — we eliminated steps. You look at Bell Rec Center and just all around. You go over to Johnson Rec Center and no steps. It is all built round. You ought to go look at those Rec facilities. You been to the Sundome? MEEKER: That impress you a little bit? MEEKER: That evolved out of that Sun Bowl. We had a symphony orchestra out there that really wanted to have a place to play because there are a lot of music lovers there. That was first class. The Sun Bowl was noisy with the airplanes and car noises and so forth, although they played there a lot and then they went into some other buildings, but the sound was never right and so when we built that facility and that was carried on — the entertainment we had plus the orchestra. There was an old gentleman out there, he looked like Arturo Toscannani, Jennings Butterfield, – have you ever seen a picture of him? STURGEON: I have, and I have heard about him. MEEKER: Great conductor. They build a pretty good country orchestra out there. Of course we immediately had the Phoenix people trying to infringe and that is there territory. Same with the museum. Politics are there I guess in all cities. Some of it reared its head where we didn’t expect it. But particularly the hospital. I didn’t realize — I thought there would be glad to see it go in out there. They were not. STURGEON: You had the same problem in Sun City West with their hospital? MEEKER: No, that was Sun Health then. That was planned and set from the outset. Sun Health was there, we already had them in the loop. In fact they built a little bit early I think in there. That was over with. They were trying to allocate beds, where you could build, bureaucratic night mare. Sun City has a lot more juice than a lot of people realize. They vote. They vote. A ninety percent turnout. I tell you, you mention that to a politician and his ears perk up. Barry Goldwater – he narrated this film that we made on – what we did when we started out, we played this for the people when they came. We had a little theater in our sales office and we started out — we said we had to sell Arizona first — and we started out with Grand Canyon, the open pit mine up in Morenci. Have you ever been to Morenci? Have you flown around there? That is one huge hole in the ground. A lot of people don’t even know it is there. Anyway we went around the state. We came to Maricopa County and they told a little story about how the canals were built — Jack Swilling did the Salt River Valley and then we turned around and we came back and said that we were — I guess there are seven wonders in Arizona and we were the eighth wonder. Some little gimmick like that. It was effective. But we sold Arizona, then the valley, and the last thing we sold was a house. That was just a side deal. We were really selling a way of life. We were pioneers. We had to overcome. People didn’t accept old people living like that in one area. Some USC really did a number on us. He thought it was terrible. But he didn’t understand. STURGEON: Was that before you started or after you started? MEEKER: After we started. They would come out and look it and put all kind of interpretations on it. Those people loved their grandchildren just as much as anybody. Those were unique people that pioneered Sun City, I want to tell you. They overcame a lot of odds. They overcame the wooly worms and the cotton, because they were still growing cotton nearby, and the wooly worms from the cotton were a real nuisance. They are not nice. When they infest a field of cotton — but the people put up with that and they were really true pioneers. They stepped up to the plate on the hospital. They formed churches out there against odds. Their mother churches would give them a bad time. The Catholic Church really gave them a bad time. I don’t know why. I guess they just didn’t feel it was right or something. But you look at the Catholic Churches out there today — you look at the first one down on 111th Avenue, then go up and look at St. Clements on Del Webb Boulevard and then go up and look at the next one up further. They are eye openers. And they are paid for. The people paid for them. But they stepped to the forefront —the people did — from all walks of life. There was no separation of better homes and little homes. The little home was in there with the big homes. That was unique — that wasn’t done. In a regular community you don’t build 100,000 dollar homes along side 500,000 dollar homes. There was that much of a disparity. Webb has changed that up a little bit and that is OK but we had no class separation. So consequently you had a cross section of people in the churches from all walks of life. They were retired. And again they were smart enough and preserved with their savings in tough times, without pension plans, to come out and buy a home and live in Sun City. They wouldn’t the good life. To play golf — and we had cheap golf and it is still the cheapest golf in the country today. You look at the success of Sun City and you really got to look at- we were the coach and sometimes the owner, but they made it happen. They jumped in there and they were the players. We had a women’s soft ball team who came to me and wanted to play in Sun City. One of our company PR guys was involved with them some way and I said OK we will take a look. And we did and we got them out there and those people fell in love with them. Some of those women’s life style weren’t exactly what they thought it ought to be out there but they understood that. I had an understanding with them and I said look, you do what you want to do but don’t do it out here. And they didn’t. It worked out great. We brought in the major league training teams. We brought in the Brewer’s. It cost us money, but it was for entertainment for the people. We built the stadium. We had soft ball games in there. We promoted all that. Hopefully we tried to not lose a lot of money. We kept the rates down cheap. Again I think that the Webb Company could — the people that took over after the Sun City people left didn’t really understand what their responsibilities were. They looked at it strictly as a business. We felt it was more than that and I think the people knew we felt that way. Because we did. They have survived. They have done OK. And I tell you, if you go out there and look at their facilities — I am involved in trying to help them raise money for a theater. We were going to build a theater and we ran out of money in the budget on the Bell Rec Center. A performing arts theater, a small one, for plays and so forth. They are out there putting it together today and they are going to get one. The Rec Centers stepped up and said Ok, we have an auditorium that we can revamp and build in and put a ply gallery in so you can ply your sets and they are getting it done. So they are still getting it done. You go out there — I would tell you to go out there. Go to the Oakmont Center, then go to Fairway Rec Center, then go to Mountain View, then come back and go to Lakeview. You go to Lakeview and you will see the change. We changed from — we used to build kind of institutionalized looking Rec facilities. They weren’t architectural monuments, they were functional. But we created a round facility at Lakeview Center, with a pool inside. It was interesting, and it created a resort atmosphere. It really, truly did. And we had the lake, man made lake, but it was a lake. We had the coots. When you have water you have coots in Arizona and they are a mess. STURGEON: You used to have bus tours didn’t you? MEEKER: Oh, yeah, that was part of the vacation program. We had some great ladies. When we started with the bus tours Jerry Svensen handled that. A lady by the name of Garnet Brown, she ran that, a feisty little gal. Told the sauciest jokes. They didn’t want to hear but they loved her. She had hostesses to take them on the bus. We didn’t have enough to show them in Sun City. We took them to Mountain Shadow and gave them coffee and doughnuts or whatever they did there. We took them to Scottsdale shopping. That was really the vacation program. That was the bus tour. That was a part of the package. Then it got so big and we had so many we gave them a western dinner and we brought in residents, paid them to come in as entertainers, they got entertainment groups out there — little bands, they would come in and they would play for these people. They would talk to them. They asked them the questions. Never any high pressure. If you liked the life style then come buy a house from us. We are here to sell you one. But we didn’t pound on them. We would send them correspondence. We had a big mailing list always. We had 15 to 20 thousand on a mailing list that we would purge all the time. We would send them a letter and say, if you don’t want us to contact you anymore just check the card and let us know and if you want us to contact just check it. They stayed on. STURGEON: Did you have any hostility from Youngtown? MEEKER: Always. They felt left out. The people in Sun City really never reached out to them. And the people in Youngtown started it because they were there and here we are starting a new one with a ours is better type attitude. They were like little kids and they never got over that. The developers of Youngtown didn’t think too much of us because we interfered with their deal with Boswell. It catered to a different life style from what we offered. We were golf and more active and they truly were the ones where they built them a house with a rocking chair and they were going to sit there and wait to die. That wasn’t our concept. STURGEON: It seems there were quite a few people that moved over to Sun City from Youngtown. MEEKER: Oh yes. Speaking of that I will give you a little side bar here. Leisure World came to the Valley and built a facility out by Mesa. It was sponsored by Western Savings and Loan. There was a guy named Larry Driggs. You just saw his name in the paper — he just got his suspended sentence and all that. So he was the guy — they were going to come in here and show us how to do it. So, they came over — a guy who used to work for us went to work for them and they said that they were going to steal five hundred sales the first month right out of Sun City. They hired an entertainer by the name of Arthur Godfrey, he was a TV personality back in those days. He had a talent show or something that he put on. He was quite well known. They hired him and they plastered him all over billboards all over the valley. They had all the billboards set up with Western Savings. They put him on the radio, television and they said, sure, see Sun City but them come see us. They would go look at their place and then come back and buy from us. We thought that was funny. Childress and I saw Driggs sometime at some function and we said, Driggs, you’ve got the greatest advertising program, just don’t quit. You are really helping us, and he got madder than hell at us. But they felt they would come in and leach off of sales from Sun City. Then an outfit called Design Masters built Country Meadows south of Olive and tried to do the same thing and didn’t. The people in Sun City were fiercely loyal to the shopping centers in Sun City and not outside of Sun City. The one in Youngtown went bust because of us. They shopped in Sun City. The exception to that was the Lucky story down on Peoria, just outside of Sun City. It was successful. We always had the people trying to say they were in Sun City when they weren’t and be way over in Glendale and say they were in Sun City. We didn’t allow that to happen. We would go right after them. They would advertise they had a Sun City Ford Dealership, Don Sanderson Ford, we did business with them. I finally had to tell him, you want to stop advertising that you are in Sun City or we are not going to buy another vehicle from you ever. He got all mad but he quit. When we started out we were building block homes south of Grand and we got our sales up and we had about 1100 homes sold out front and the masons went on strike. I told our masonry sub-contractor, you better tell that union guy that if he doesn’t get that strike settled we are going to go to frame. So this arrogant guy comes in to see me and I told him – like now. He said we will settle it when we are ready to and I said fine. I sent out letters to those 1100 sales we had asking them if they wanted to wait for their homes we would build it masonry, but we were going to switch to frame. We had one out of 1100 sales that wanted a masonry house. So when the strike was over this arrogant guy comes swaggering into my office – “You can stop those dumb frame houses, we are back and ready to go work.” I said, you are not going to work here, partner, you are done. You are really done — you did it to yourself. Oh, man, the sub-contractor wanted to whip him right there in my office. We are not going back. And they got wiped out within a week. We sent the letters out overnight letters. We had to do something. We got a little dose of that in California. When you wait for all those sales, people won’t wait. They want their home when they want it. We switched and stayed frame. We used some masonry. Our poor masonry contractor was in tears and I told him, just hang on. You are still going to have a lot of work. We are going to have a lot of fences and we put more brick veneer on the houses. I said you will be fine and he was. What else you got in there you need to ask me? STURGEON: I think that is just about it unless there is anything you can think of that you would like to add. I really appreciate you taking all this time. MEEKER: Be sure to talk to Johnson and Boswell if you can. Get them to – Freeman knows both of them. She can get Boswell. It would be nice to have him on tape. Because he has a different perspective on some things. I must say he was an integral part of the success of Sun City. When I became involved he and I just became friends. He was very supportive of new ideas and things we wanted to do. When we did that lake that was a big step for us. We changed our concept a little bit, we stepped up. We spent more money on Rec facilities. He was very supportive and really a key player in the success of Sun City. That hospital would have been nothing had he not stepped forward. He did that on his own. We were willing to settle for a lot less. STURGEON: That was a million dollar endowment. MEEKER: Well, I think he ended up giving five million over a period of time, what his foundation has given to the hospital. He was there when we started. He said he wanted it to be a landmark. The last item, he wanted it to be a landmark. So we said OK. Instead of sticking a basement and two levels in the ground, we stuck it on top of the ground. Put the entry way up high. That is why the entry is up high the way it is today because he wanted a landmark. I said, how is four floors, or six floors. He said, that’s good. STURGEON: And it is, you can see it from the freeway. MEEKER: That is why it got there. Ordinarily, the basement — the service areas would have been down. That is why the driveway to the front is way up. STURGEON: That’s why it looks like it is on a hill. MEEKER: The hill was created out of that lake over across the way. 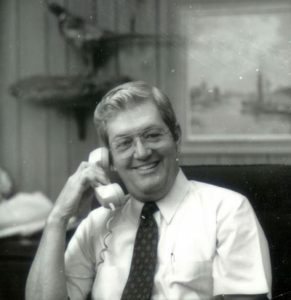 Bob Johnson was also a key player. He was my boss and he attended all of our board meetings and stayed active, was concerned over some of the things we did, but I think he was very happy with the development of Sun City — make a lot of money and fulfilled a need for the people. It was a two way street. And like our signs used to say, it changed the nation’s viewpoint on retirement living. And it truly did. STURGEON: Well, thank you very much. When the Del Webb Sun Cities Museum reopens to the public this fall, it will do so with a new and unique designation: The only building in the Sun Cities now listed on the National Register of Historic Places. Museum officials were notified last spring that after several years of applying for the designation, the museum was finally granted historic status. The museum, located at 10801 W. Oakmont Drive in Sun City, is home to the Sun Cities Area Historical Society. The organization was created in 1985 with a mission to preserve and present the history of Sun City and Sun City West. The museum is located in one of the first five model homes built by the Del E. Webb Corporation in 1960 as it prepared to launch Sun City, the nation’s very first master-planned, active-adult retirement community. The community opened to the public on Jan. 1, 1960. The five model homes, along with Oakmont Recreation Center and a golf course were open to the public on that first weekend. The home has been restored and features rotating exhibits focusing on the history of the community, as well as its developer – Del E. Webb – and the clubs and organizations in the retirement communities. “We’re extremely proud of our museum and think it’s a fitting honor to be recognized as one of our nation’s historic landmarks,” said Bret McKeand, president of the museum’s board of trustees. The National Register of Historic Places is the “official list of the nation’s historic places worthy of preservation.” The list is overseen by the National Park Service. Presently there are over 80,000 places on the list. Locations on the list in Arizona include the Wrigley Mansion, Hunt’s Tomb, Petrified Forest and Canyon de Chelly National Monument. The Del Webb Sun Cities Museum becomes the first property in either Sun City or Sun City West to earn the designation. The museum is closed during the summer and is expected to reopen Wednesday, Sept. 16. Museum hours are 1-4 p.m. Monday, Wednesday and Friday. When the museum opens this fall, exhibits include a celebration of the performing arts in the Sun Cities, a display honoring Del E. Webb, and a new tribute to the Sundome Center for Performing Arts. The museum is a nonprofit organization and relies on memberships for its funding. Call 623-974-2568 or visit delwebbsuncitiesmuseum.org for information on supporting the organization.